WHY PATIENTS CHOOSE OUR OFFICE FOR THEIR RADIESSE TREATMENTS? 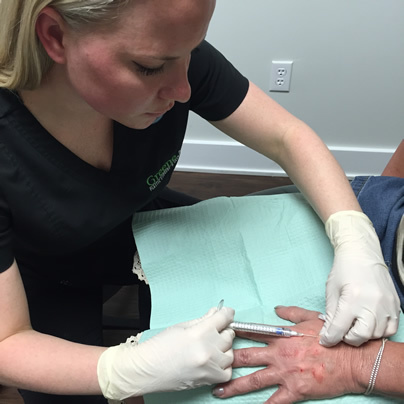 Holly Rafferty, Certified Physician Assistant, is a certified injector of Radiesse to the hands. Holly works with Dr. Greene and they have developed a busy office-based practice optimizing patient outcomes through non-surgical treatments. Holly enjoys always spending time educating patients in order for them to feel comfortable and fully informed before their procedure. She is also committed to achieving the best outcome for every patient. The loss of volume in the dorsal hands is one of the hallmarks of aging. Often the hands are neglected as most people focus on facial treatments. Radiesse is an ideal filler to restore lost volume on the back of the hand. One of the many benefits of Radiesse is that it delivers immediate results for patients looking to restore volume in the aging hands. In addition to replenishing lost volume, Radiesse also stimulates collagen production to promote a more long-term improvement. In many patients, this extended correction can last for up to one year. Like the Hyaluronic acid fillers, there are very few side effects. There is virtually no risk of allergic reaction, and the most common side effects are mild swelling and bruising. Since it is composed of calcium hydroxyapatite, Radiesse integrates well with the anatomy of the hands. It can also be molded and shaped into the desired contour after injection to create an even and natural appearance. Virtually anyone with volume loss of the dorsal hand is a candidate for treatment with Radiesse. Patients of all age groups can benefit from Radiesse treatment, but those with more significant volume loss and signs of aging tend to require more filler volume. Holly Rafferty, PA-C will first perform a thorough consultation and assess your hands to determine if you are a good candidate for this treatment. If you wish to proceed with treatment, we first apply a specialized topical numbing cream to your hands prior to treatment. The injections themselves take approximately 10 to 20 minutes to perform. The treatments involve very small needles, and sometimes cannulas, that are virtually painless due to the numbing cream and Holly’s gentle technique. There is also pre-mixed lidocaine (an anesthetic agent) with the filler, which further enhances comfort. After Holly injects the Radiesse to the back of your hands, she then massages the area to ensure that it is properly distributed. Patients are instructed to avoid strenuous physical activity involving their hands for the following 24-48 hours after injections in order to minimize post-procedure swelling and tenderness. Radiesse is a facial filler made up of calcium hydroxyapatite, a naturally occurring substance, that is suspended in a water based gel. Its unique properties give it an excellent lifting capacity, making it well suited for restoring volume in the specific areas of the face, as well as the hands. At GreeneMD, patients find that there is almost no discomfort during treatment. We have a pharmacy customized compound numbing cream for our patients. We apply the topical numbing cream to the hands 10-15 minutes prior to your procedure. There is also pre-mixed lidocaine with the filler to enhance patient comfort. IS THERE ANY DOWNTIME OR SIDE EFFECTS AFTER A RADIESSE INJECTION? The most common side effects are temporary bruising, swelling, redness, tenderness, or nodules. Patients may experience mild swelling after the procedure that can last up to 1-2 weeks. We instruct patients to limit strenuous physical activity that involves their hands for the first 24-48 hours after the procedure. Occasionally, bruising may occur at the injection sites. Avoiding certain medications and supplements, such as baby aspirin and fish oil, can minimize bruising. Use of injectable fillers such as Radiesse requires experience, expert judgment, and advanced understanding of the hand anatomy. Holly Rafferty is a certified and licensed Physician Assistant working under Dr. Ryan Greene. She is trained and certified by Merz specifically for Radiesse Hand Filler treatments. To learn if Radiesse is right for you, Holly Rafferty, PA-C will perform a thorough consultation and assess your hands. To set up your complimentary consultation, please call the office at 954-651-6600. CAN RADIESSE BE COMBINED WITH OTHER HAND REJUVENATING PROCEDURES? Yes, Radiesse can often be combined with other cosmetic hand treatments. In fact, Holly often performs a combination of treatments for the same patient in order to achieve the absolute best result. 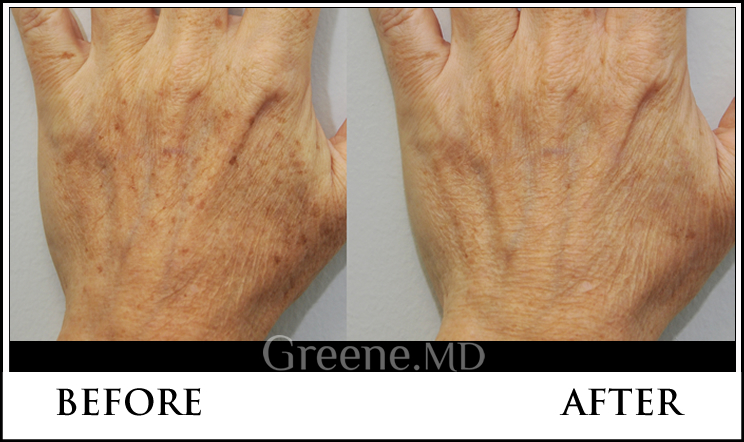 Another popular treatment to reverse signs of aging of the hands is IPL photofacial to remove brown spots and sun damage. Click here to learn more.